Top panel: 3–24 keV image of the field around the detected serendipitous source. The green cross marks the position of the blazar LBQS 1319+0039 from Petrov (2011). Bottom panel: NuSTAR X-ray spectrum of LBQS 1319+0039. Black and red crosses denote the measurements from the two NuSTAR Focal Plane Modules A and B, respectively. The corresponding black and red lines show the best-fit models to the X-ray spectrum, which includes a cross-calibration constant and a power-law component. Credit: Privon et al., 2018. An international team of astronomers reports the detection of the blazar LBQS 1319+0039 in hard X-rays using NASA's Nuclear Spectroscopic Telescope Array (NuSTAR) space telescope. The finding, updating knowledge about this object, is available in a paper published September 26 on the arXiv pre-print repository. In general, blazars are perceived by astronomers as high-energy engines serving as natural laboratories to study particle acceleration, relativistic plasma processes, magnetic field dynamics and black hole physics. Therefore, observations of blazars in different wavelengths could be essential for improving the understanding of these phenomena. Based on their optical emission properties, astronomers divide blazars into two classes: flat-spectrum radio quasars (FSRQs) which feature prominent and broad optical emission lines, and BL Lacertae objects (BL Lacs), which do not. LBQS 1319+0039, at a redshift of 1.62, was initially classified as an FSRQ. However, new observations show that this object also exhibits emission in hard X-rays. The finding was made by a group of researchers led by George Privon of the University of Florida in Gainesville, Florida. The scientists were observing the spiral galaxy NGC 5104 with NuSTAR, and during these observations, they unexpectedly observed LBQS 1319+0039 in X-rays. "We report a serendipitous hard X-ray (3–24 keV) detection of the blazar LBQS 1319+0039. This detection was obtained during a 20.7 ks Nuclear Spectroscopic Telescope Array (NuSTAR; Harrison et al. 2013) observation of NGC 5104," the astronomers wrote in the paper. 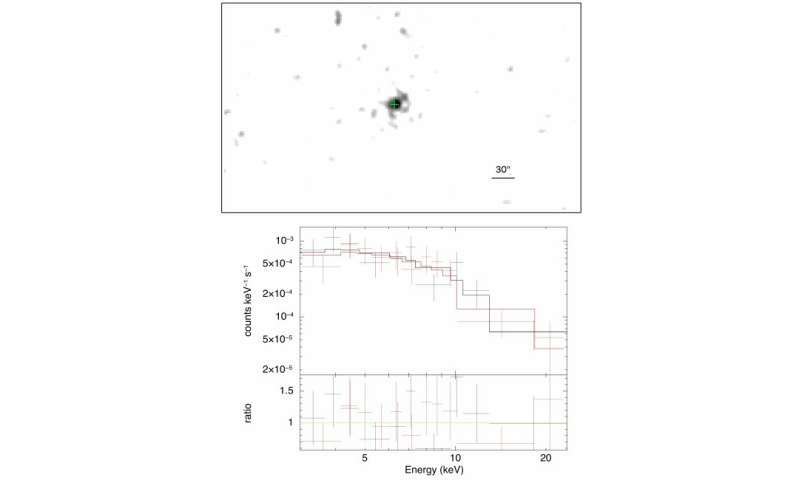 The researchers noted that the hard X-ray emission was identified at a position consistent with that of the blazar LBQS 1319+0039, during the analysis of NuSTAR observations. The analysis of the collected data was conducted with the use of NuSTAR Data Analysis Software (NUSTARDAS) v1.8 within Heasoft v6.2. "We modeled the X-ray spectrum with a simple power-law model, considering also a constant to account for possible cross-calibration between the two focal plane modules on board NuSTAR," the researchers wrote. As a result of the analysis, the astronomers found that in the case of LBQS 1319+0039, the X-ray spectrum is consistent with powerlaw emission with a photon index of 1.72, while the cross-calibration constant is 0.93. The observed 2–10 keV luminosity was calculated to be approximately 3.4 quattuordecillion erg/s. The authors of the paper concluded that their results suggest that X-ray emission in LBQS 1319+0039 is typical for hard X-ray blazars. They noted that the observed photon index is consistent with the median value (1.68) found for the sample of hard X-ray blazars studied by the Burst Alert Telescope (BAT) onboard NASA's Swift space observatory.